Curtains are definitely a quick and easy way to give any room a lift. In mere minutes, the right kind of curtains can turn a drab room into a beautiful one. They are also an easy way to add interest and color to any space. Curtains give a room a more finished look and fortunately, the options for curtain styles are endless. From shades to drapes to blinds, there are many possibilities for you to consider based on both functionality and design. For example, if you need privacy and complete darkness in a room, linen curtains are the best possible option. If you would rather have light filtering through, or want curtains to be purely decorative, you can opt for unlined curtains. Lining does have its advantages; it can shield the fabric from sun damage and therefore, make them more durable. While there are certainly several different styles, some are more popular than others. Flat panel curtains are perhaps the easiest and most versatile curtains, where pieces of fabric are simply boarded on all four edges and hung from decorative curtain poles using clip-on rings. 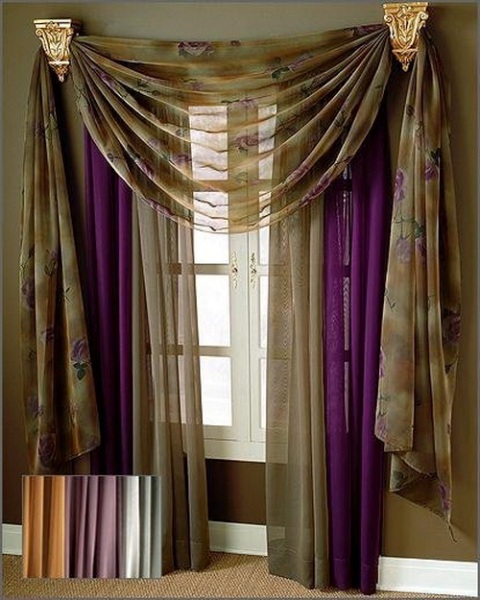 Sheer fabric material is used for sash curtains. Thermal or blackout curtains generally use tightly woven fabric in multiple layers. Not only do they block all light, they also serve as an acoustic controller, which can be very useful at times. Heavy silks and velvets are great insulators when used as drapes. Rayon and cotton blends, on the other hand, are more practical; as they are the washable kind while billowy linens give a more casual feel. The fabric used makes all the difference. No matter the types of curtain styles you are working with, it’s best to measure the windows dimension and determine the length of the curtain before making a purchase.